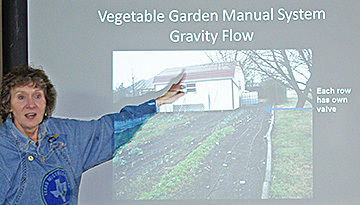 Master Gardener John Flickinger digs into the subject of growing a successful Spring vegetable garden. Master Gardener Dana Morisse-Arnould tells how she, despite the fact she's a girl, can easily assemble a drip irrigation system. 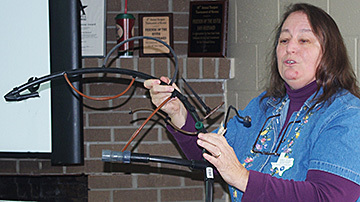 Master Gardener Sandy Hurst tested attendee's dexterity by passing out parts to a miniature drip irrigation system and asking them to assemble it. 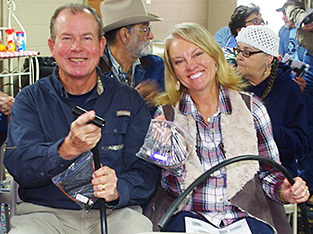 FOR Environmental Committee Chairman Tim Logan and wife Jane work on the parts to a drip irrigation system. 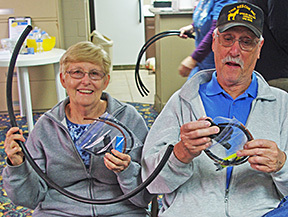 Michael and Mrs. Murphy hold tubing during the hands-on portion of the program. Cynthia tells Victor Grandjean, "it's supposed to look like this!" 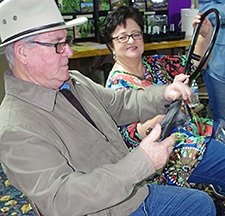 Brazoria County Master Gardeners entertained a group gathered at the FOR community house on Saturday, January 28, with their wit and in-depth knowledge of gardening and rainwater harvesting. The first education program of 2017 promoted by the FOR Environmental Committee was a great success with over 20 area participants. 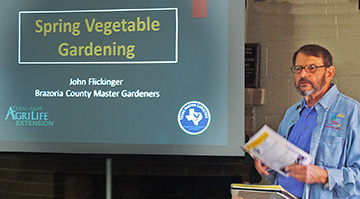 Brazoria County Master Gardeners John Flickinger, Dana Morisse-Arnould and Sandy Hurst volunteered as presenters. Attendees now know how to ripen their tomatoes off the vine, how to tell the difference between a bean and a pea, and how to build rainwater irrigation systems. Thanks to Brazoria County Master Gardeners for providing fresh fruit and juice refreshments and to FOR volunteer Jim Hillis who arranged for two gift certificates to the BCMGA citrus tree sale upcoming on February 11, 2017. Here's a couple of tips learned at the gardening program. Cutworms wreak havoc on tender new tomato plants by chopping them off at ground level. Avoid this by making a cutworm barrier from leftover toilet paper cardboard rolls. Simply use a pair of scissors and cut a slit up the side of the cardboard tube to make an adjustable paper collar. When you plant the seedling, open the tube and wrap it around the plant’s stem, close it up and push into the soil. Leave the tube empty for better watering. The tube will eventually disintegrate and compost back into the soil. Here’s a suggestion from Master Gardener Jim Hillis who grows tomatoes on the west bank of the San Bernard. Use a 10% vinegar rinse to help keep freshly picked tomatoes last longer. First wash the tomatoes with a solution of 1 oz. Dawn liquid soap to 5 oz. water. Then spray with a solution of 10% vinegar (in whatever units you're using – teaspoons? 1 teaspoon vinegar, 9 teaspoons water; cups? 1 cup vinegar, 9 cups water; gallons? 1 gallon vinegar, 9 gallons water. As long as your parts add up to 10, you're good). Rinse. Set the tomatoes on paper towels in a tray to ripen. Happy eating!